Blockchain technology is ready to cause disruptions in most of the existing industries. It can disrupt these industries by bringing an array of upcoming business models. Blockchain has come up with some of the valuable developments, for example, decentralized and transparent systems. One of the noteworthy determinants that have played a major role in the accomplishment of this technology is token. Nowadays, many companies are coming up with the idea of utility tokens and tokenized securities, which gave birth to companies coming in the business of token development. These ideas are helping them in getting investments of millions of dollars. What is the meaning of these terms? How a security token varies from a utility token? In this blog, we will get to know about all these terms. A token is a unit, an asset, or a value of significant worth, issued by an organization. Most commonly, tokens are dispensed when an organization launches an ICO ?that functions like an IPO. The difference between an IPO and ICO is that, if you are investing in an IPO you get stocks in return for the money you have invested. If you are investing in an ICO, you get a token in return for the money you have invested. Chaos emerges in distinguishing between utility tokens and security tokens. Despite the fact that they may appear to be complex at first, they are actually easier to understand. A security token, a digital resource that gets its valuation from a physical asset that can be exchanged. In this way, these tokens are liable to government laws that administer securities. Inability to obey these rules could result in critical outcomes including punishments and potential derailment of that project. The most encouraging aspect of these tokens is the capacity to utilize them as digital shares of an organization's stock. The crucial difference in utility tokens and security tokens is that both have their different functionalities and usages. Security tokens are developed as investments. Token holders are proffered with profits as extra coins, each time the organization is making gains. Users owning the security token get responsibility for the organization. Blockchain grants a stage that can be utilized to make a voting framework that enables financial specialists to practice control on the organization's decision making procedure. Utility tokens empower users to access an organization's services. Utility tokens and Security tokens can increase its valuations if the costs of the tokens acknowledge in the market. What's more, since they both acquire some gain, numerous individuals may find it hard to separate them. 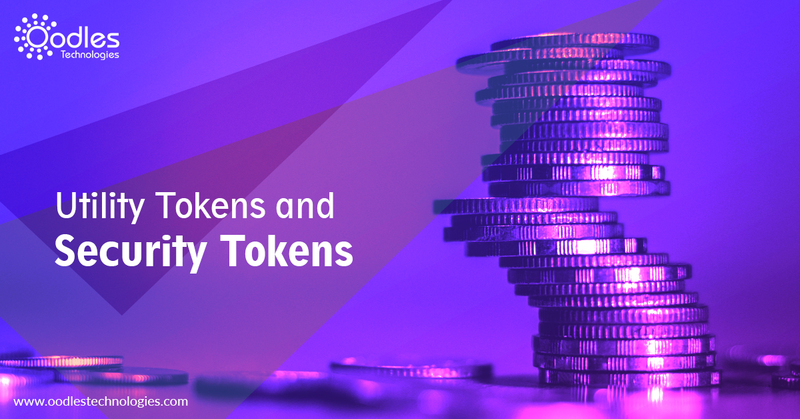 Provided information in this blog is useful in understanding and will surely help you in differentiating utility tokens from security tokens. Oodles Technologies a well-established name in STO and ICO development, from the last few years. We work 24*7, so for any of your cryptocurrency or blockchain based requirement, please feel free to Contact Us.